Is it time to replace your old furnace? The average life expectancy of a furnace in Prescott is 15 – 20 years. Prescott Air Conditioning and Heating believes in fixing old heating units instead of replacing them. If you decide to replace your old heating unit, here are some tips. Decide which type of furnace to install. Your options are natural gas, propane, electric, and oil. There are many options and manufacturers. Chances are the choices now available didn't exist when your original unit was purchased. Most residential furnaces in this area are powered by natural gas. The cost of a standard efficiency natural gas furnace can vary on many factors and brand you choose. Installation costs are additional, depending on the complexity of the install or if you choose a higher efficiency unit. Gas furnaces come with a host of choices which can affect their price. The first is heat output, measured in British Thermal Units (BTUs); an "average" home is well served by a 60,000 BTU furnace. Units with higher BTU rating aren't necessarily better for smaller homes, since they'll cost more and hit ideal temperatures too quickly, then shut off, resulting in hot or cool areas within the home. Older-model furnaces were often rated 80 percent efficient or less, which means 20 percent of the heat generated was lost to waste. Many new models are rated 90 percent or better, with some in the 94 to 95 percent range. This small jump in efficiency translates to a decrease in utility costs. It's also important to determine how effectively a gas furnace can heat your home, in large part determined by its "staging." Older furnaces were one stage, meaning they always ran at full power. Many newer furnaces are two stage, capable of running at 65 percent when first starting up to conserve fuel, and then ramping up to 95 percent as needed. More expensive three stage models also exist, which can run anywhere from 33 to 90 percent power in 1 percent increments. Installing a furnace also comes with labor costs. Install costs may run higher if extensive duct-work repair or modification is necessary or if a new furnace is significantly smaller or larger than an existing unit. Make sure you understand the manufacturer's warranty, which protects against defects in the furnace itself, such as inoperable fans or pilot lights that won't stay lit. Carefully read the warranty for specifics. A contractor's warranty covers the labor. It covers repairs if the furnace doesn't work properly and is often good for a period of 5 to 10 years. Some contractors sell extended warranties. 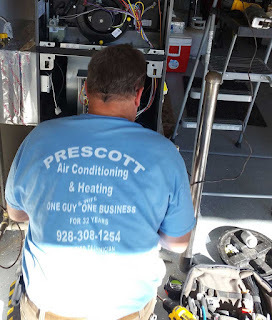 Prescott Air Conditioning and Heating Repair would like to remind you that there is no right or wrong time of year to have your heater inspected. A good maintenance plan will give you peace of mind and increase the life of your current unit. You can learn more about our service by calling 928-308-1254 to schedule an appointment to see if it is time to replace that old furnace.